CarGurus has 6,729 nationwide Sierra 3500HD listings starting at $8,995. Got a full-size fifth-wheel trailer to haul around? 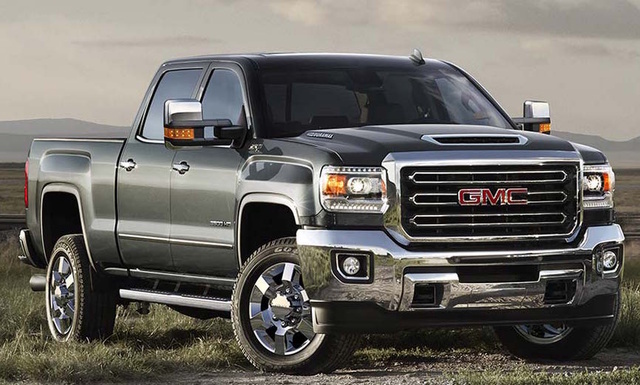 The GMC Sierra 3500HD will tow it with no problem. And once you set that trailer on its pad, this full-size heavy-duty pickup will be ready to take you off-roading in the mountains, on a sightseeing tour, or even to the theatre without seeming out of place. Since its 2007 debut, the Sierra 3500HD, with its hefty payload capacity and multiple cab configurations, has schlepped countless crews and their equipment around American construction sites. Its increasingly luxurious appointments now make it an appealing option for the site foreman’s family, as well. For 2017 the Sierra 3500HD is available in four trim levels: Base, SLE, SLT, and Denali. It offers three cabs sizes and two bed lengths: a 2-door, 3-passenger regular cab; a 4-door, 5/6-passenger double cab; and an even roomier 4-door, 5/6-passenger crew cab, with either an 8.2-ft long bed or a 6.6-ft standard bed (available only to single rear-wheel crew cabs). Optional dual rear wheels (DRW) can be added for some extra payload muscle. While the Sierra 3500HD comes standard with rear-wheel drive (RWD), part-time 4-wheel drive (4WD) is available across the lineup. Offering low-range gearing, an automatic-locking rear differential, and a rotary-dial 4WD shift controller, the 4WD system allows for some serious terrain busting. Add the optional Z71 Off-Road Suspension package with descent control, all-terrain shock absorbers, 18-inch off-road tires, and skid plates, and you can take this truck on rock-studded mountain paths, over soft desert sands, or through winter’s worst snows with ease. A Flex-Fuel (FFV) gasoline-fired 6.0-liter V8 engine is standard on the Sierra 3500HD and combines with a light-duty 6-speed Hydra-Matic 6L90 shiftable automatic transmission to throw down 360 hp and 380 lb-ft of torque. Towing capacity maxes out at 14,600 pounds, and payload maxes at 7,153. This V8 can also be converted to burn compressed natural gas (CNG), but power will drop to 301 hp and 333 lb-ft.
An optional and heavily reworked 6.6-liter V8 turbodiesel powerplant mated with a heavy-duty 6-speed Allison 1000 shiftable automatic transmission tops the list of available upgrades for the 2017 Sierra 3500HD. This V8 puts out 445 hp and 910 lb-ft of torque, which is 48 hp and 145 lb-ft more than the current turbodiesel, and reworked internal parts allow the new mill to run much more quietly, too. Towing capacity with the new engine maxes out at 23,200 pounds and payload at 5,518. A new hood scoop combines with a duct below the front fender to force-feed cool outside air into the turbocharger. This system results in significantly more-efficient performance than the previous engine setup, in which the blower receives tepid air already warmed by the engine compartment. The new intakes are also engineered to more effectively deal with the fine mist kicked up on wet roads that often degrades turbocharger performance. The upgraded air-induction system was tested extensively through the Eisenhower Tunnel, which is perched at 11,153 feet above sea level just outside Denver, Colorado. The Sierra 3500HD’s appealing and well-appointed cabin boasts comfortable seats, easy-to-read gauges, a 4.5-inch (or larger) infotainment display, and intelligently located controls. Upgrades and changes for 2017 include a capless fuel filler that comes standard with the gasoline V8, two new exterior paint colors (Dark Slate Metallic and Pepperdust Metallic), and available 20-inch 6-spoke polished-aluminum wheels. Standard creature comforts for the Sierra 3500HD Base trim level include cloth seats, chrome bumpers, LED running lights, and high-intensity discharge (HID) headlights. The SLE trim level adds the OnStar infotainment system, a 4GE LTE Wi-Fi hotspot, and IntelliLink with Apple CarPlay and Android Auto. The SLT trim adds heated leather front seats, memory for driver’s settings, front foglights, and extra chrome accents, while the Denali trim boasts front-seat ventilation, GPS navigation, and chrome side steps. The Sierra 3500HD can be customized with options like various rear axle ratios, a gooseneck or fifth-wheel trailer hitch, a bed storage box, power-adjustable and folding tow mirrors, and a rear-seat DVD entertainment system. An All-Terrain package is available for 4WD crew cabs with the SLT trim and features Rancho twin-tube shock absorbers, 18-inch all-terrain tires, a spray-in bedliner, skid plates, an All-Terrain grille with chrome surround, body-color bumpers, a heated steering wheel, and unique All-Terrain badging. Standard safety equipment for the Sierra 3500HD includes 4-wheel antilock brakes (ABS), traction and stability control, trailer-sway control, and full-length side-curtain airbags. Higher trim levels come with OnStar emergency telematics, turn-signal-integrated mirrors, and a remote antitheft alarm, while an optional Driver Alert package offers lane-departure warnings, forward-collision alert, and a safety-alert driver’s seat. New for 2017, GM’s programmable Teen Driver Mode allows parents to limit speed and audio settings when one of the kids takes the truck for the evening. Now in its third generation, the 2017 Sierra 3500HD goes up against challengers like the Ford F-350 Super Duty, the Ram 3500, and its GM cousin, the Chevrolet Silverado 3500HD. The 2017 Sierra 3500HD Base trim starts at $34,990, while the Denali goes for $55,280 without options. What's your take on the 2017 GMC Sierra 3500HD? GuruV6R12 For night time driving it has the poorest headlight and fog lights I have ever experienced. Owner will have to spend money on up-graded aftermarket lighting to see where you are going during the night. Users ranked 2017 GMC Sierra 3500HD against other cars which they drove/owned. Each ranking was based on 9 categories. Here is the summary of top rankings. Have you driven a 2017 GMC Sierra 3500HD?